Watching a cross cut saw competion with sawdust flying and a person on either end of the saw huffing and puffing is entertaining but it isn’t the way it’s done when clearing miles of wilderness trail. Cross cut saws can be used efficiently with a slow and steady push-pull that won’t wear the sawyers out. Long days in the mountains clearing charred logs from trails leaves the sawyers covered in soot including inside their noses, eyes, and ears. It takes a exceptionally sharp blade to cut effectively through logs exceeding three feet in diameter. 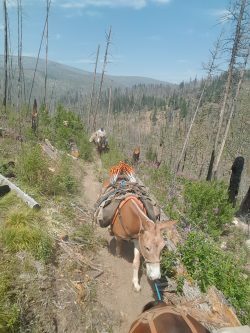 Next time you’re on a wilderness trail and hike or ride past a massive cut log be sure to appreciate the efforts of those who keep the trails cleared. 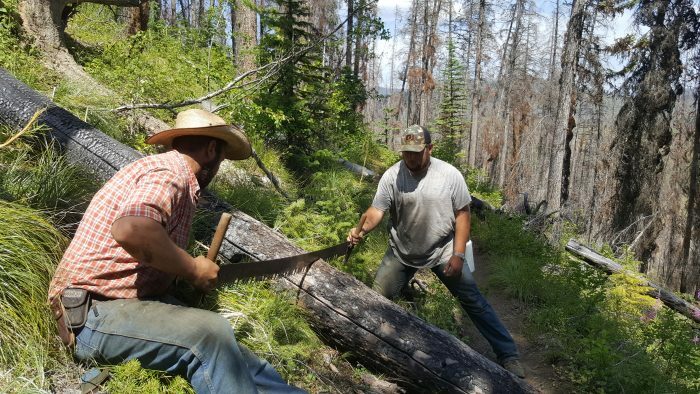 Trails in Montana are cleared by volunteer groups, Outfitters and trail crews. Without their help it would be extremely difficult to navigate through our wild places.